Story of the Week: Autres Temps . . .
Autres Temps . . .
Save 20%, with free shipping! 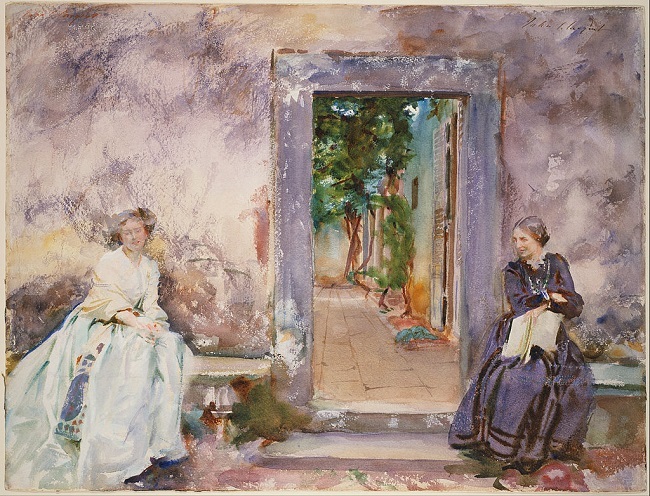 John Singer Sargent, The Garden Wall (a scene in a villa outside Florence, 1910), watercolor over graphite pencil on paper. Image from the John Singer Sargent Virtual Gallery. It was announced in New York city the other day that Mrs. Julia Borland Higginson and J. Wheatland Smith had been married in Paris recently. From the cable so far little information has been had about the particulars of this last step in one of the most remarkable elopements that has been heard of in many years. The wedding comes a little late, for Mrs. Higginson sailed from New York last November with Mr. Smith. . . . She left four children when she eloped—one of them a daughter 18 years old, who had just made her debut in society. The man she eloped with was fifteen years her junior and had nothing but his good looks and his fists to commend him to public attention. . . .
Edith Wharton would use this domestic drama as the inspiration for “Other Times, Other Manners,” a story that appeared in 1911. (Echoing the French expression autres temps, autres mœurs—other times, other customs—she changed the title when she included the story in her 1916 collection, Xingu and Other Stories.) There are significant differences between the real-life incident and Wharton’s fictional retelling, the most notable being that the Higginson children severed virtually all ties with their mother once their father sued for divorced and remarried in 1898. In addition, the circumstances surrounding Wharton’s own marriage almost certainly and perhaps subconsciously influenced the development of the story. Since the late 1880s, Edward (Teddy) Wharton had increasingly suffered bouts of erratic behavior, depression, and alcoholism. After 1906, while her husband underwent a series of cures at resorts and stays in sanatoriums, she began living in Paris, had an affair with Morton Fullerton (a friend of Henry James), and discovered that, back in America, her husband had embezzled $50,000 from her trust funds. In 1911, around the time she wrote “Other Times, Other Manners,” she began negotiating the terms of a separation from her husband; they were divorced in 1913. For the last century, readers and critics have assigned to “Autres Temps . . .” a special place in Wharton’s oeuvre. It was greeted with universal praise on both sides of the Atlantic when first published: the New Republic called it “one of her best stories,” The New Statesman extolled it as “perfect of its kind,” and the Times Literary Supplement exclaimed, “Mrs. Wharton has never done a better thing.” More recently, the famous Wharton scholar R.W.B. Lewis labeled it one of her “luminous exercises in social realism,” the literary critic Blake Nevius wrote that it “is probably her best short story,” and biographer Hermione Lee included it in a list of the six best Wharton stores. Mrs. Lidcote, as the huge menacing mass of New York defined itself far off across the waters, shrank back into her corner of the deck and sat listening with a kind of unreasoning terror to the steady onward drive of the screws. . . . If you don't see the full selection below, click here (PDF) or click here (Google Docs) to read it—free! This is an excellent story and a pleasure to read. Which are two ways of saying the same thing. I am so glad to have had the chance to read it. Often I have to leave a new story unread for a few days or even weeks until I find the spot of time for it, but I always eventually come back. I hope that other readers enjoy Wharton too.